Outside of nailing the draft, accomplishing the feat of rocking the beloved kelly green uniforms at Lincoln Financial Field in the not so distant future might just be a top priority for the Eagles. That is, if you ask Eagles fans. The classic uniforms that have a special place in the hearts of Eagles fans everywhere have not been sported since the regular season opener back in 2010 against the Green Bay Packers. Yes, that game was remembered as Michael Vick’s debut in his “Comeback Player of the Year” season, where the Eagles almost pulled off the second half comeback. But more importantly in that celebration of the 1960 championship team, we got to witness one of the greatest jerseys of all time being rocked to perfection. Fast forward to 2018 and both the team and fan base are calling for the return of the kelly green uniforms. 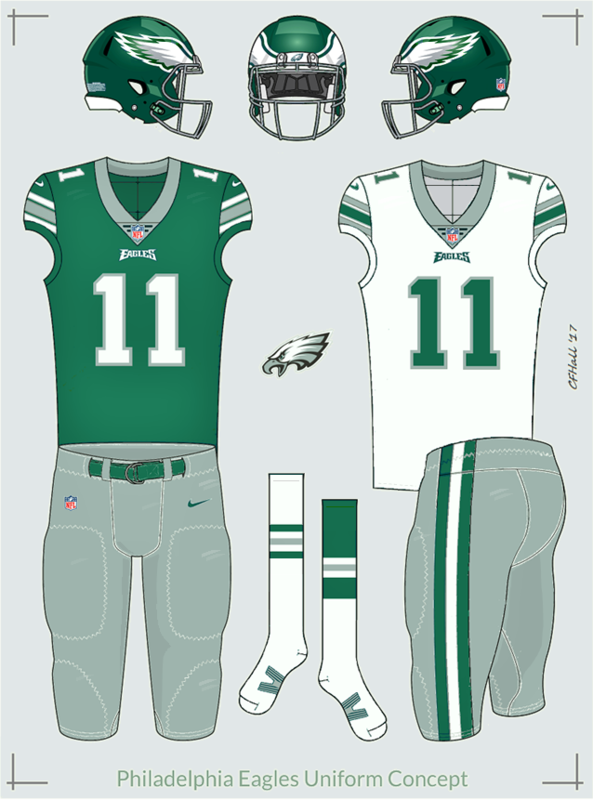 Some want it as a replacement for the midnight green, however Eagles Owner Jeffery Lurie wants to bring it back as an alternate to the current uniforms. Lurie has been fighting with the NFL for kelly green since the start of last off-season. The problem? The NFL currently has a rule in place that only allows for one helmet per player. 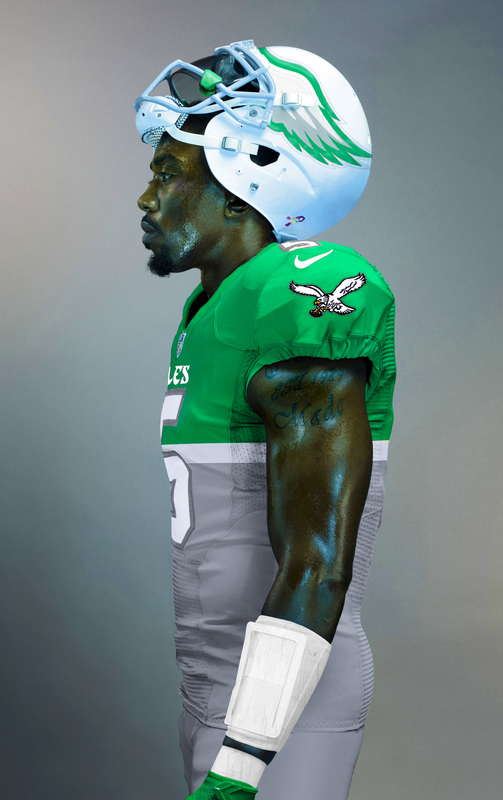 Unless you like this look, the Eagles need the kelly green helmet to go with the jersey. According to Lurie (who spoke about this process at a press conference last month), it has taken a year and counting to get a second helmet allowed because some owners don’t want the current rule to change. Why this is even a rule in the first place is puzzling. If it is about player safety, why would the NFL be against simply measuring a player for two helmets instead of one at the beginning of the season? Even more than two helmets shouldn’t be an issue. 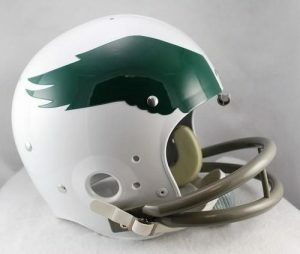 If the Eagles wanted to also bring back their white helmet with the green wing, why can’t the same process that happens when a player is measured for their helmet at the beginning of team activities happen multiple times for the number of helmets the team would like to use that season? The NFL could be paranoid about anything that has to do with concussions, just think a money hungry institution like the NFL and its owners would love to profit off jersey sales for retro jerseys, new alternates with different helmets, etc. It would certainly make Thursday Night Football and the “Color Rush” series a lot more popular if the Eagles in their Kelly green jerseys came out against the Titans wearing their Houston Oilers getup. 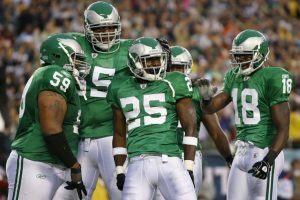 Pretending that the NFL changes the rule and the Eagles can now bring back Kelly green, either as a replacement for midnight green, or as an alternate, here are some cool jersey designs the Eagles could rock in the classic colors. These are a personal favorite. 2010 was my favorite season growing up as a young Eagles fan (really dates me doesn’t it). 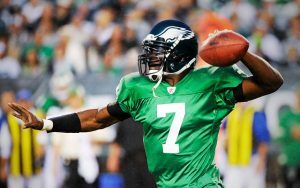 Seeing Michael Vick run all over Green Bay in these beauts could not have been more perfect. The uniforms are so simple yet so crisp. No crazy designs around the jersey, or even a logo. The color and smoothness of the jersey is the attractive part. It doesn’t need anything else. The white paints with a two green stripes, the socks. This may be the greatest jersey in NFL history. 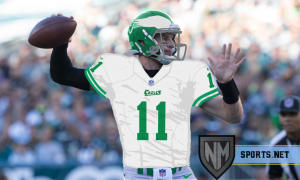 These as the alternate would be a lot of fun but…..after seeing one game of Carson Wentz throwing darts to Zach Ertz in these babies, fans may be calling for these with a new away jersey to be the main getup. 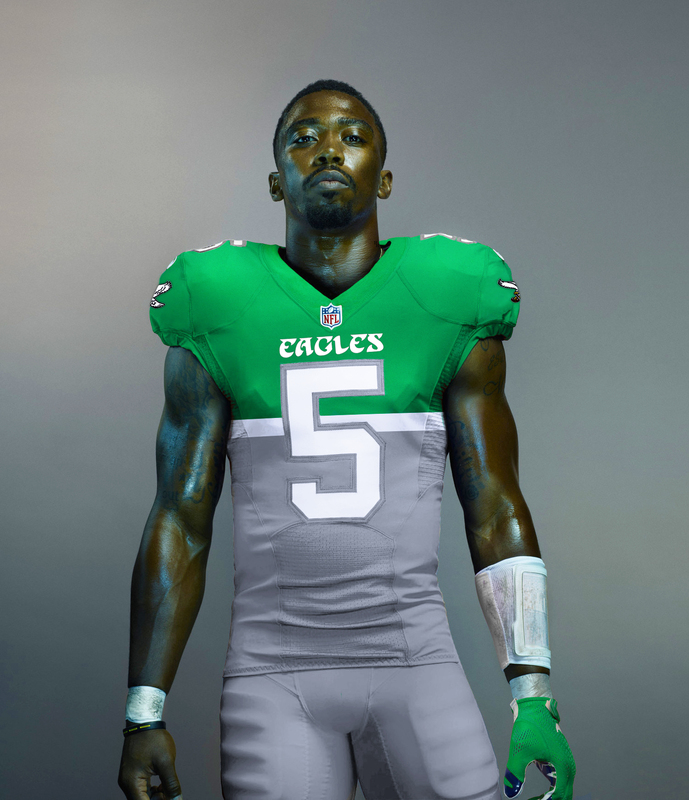 If the Eagles went to Kelly green full time, this jersey concept could be what they go with. 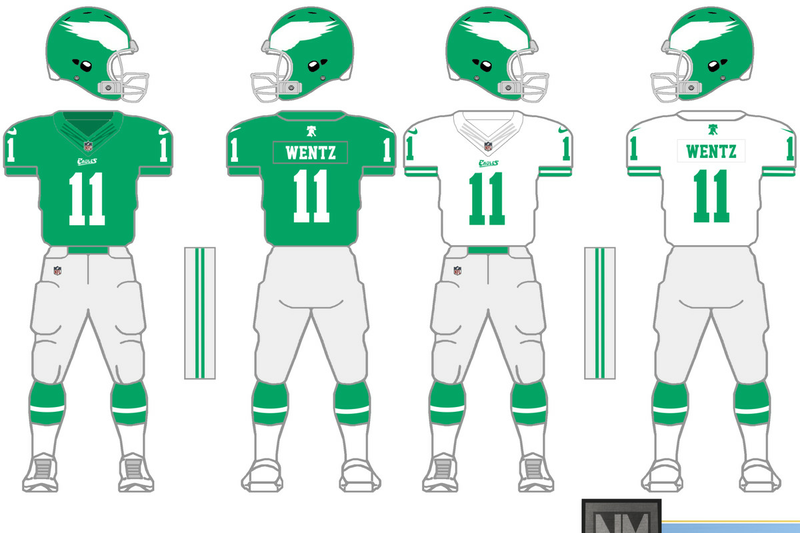 These are a depiction of Wentz in the above jersey concept. 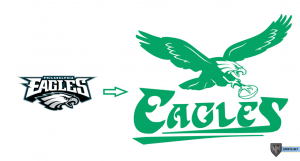 If the Eagles went to these jerseys full time, this could be the new logo. Nice way of keeping the current eagle head, with the old body. 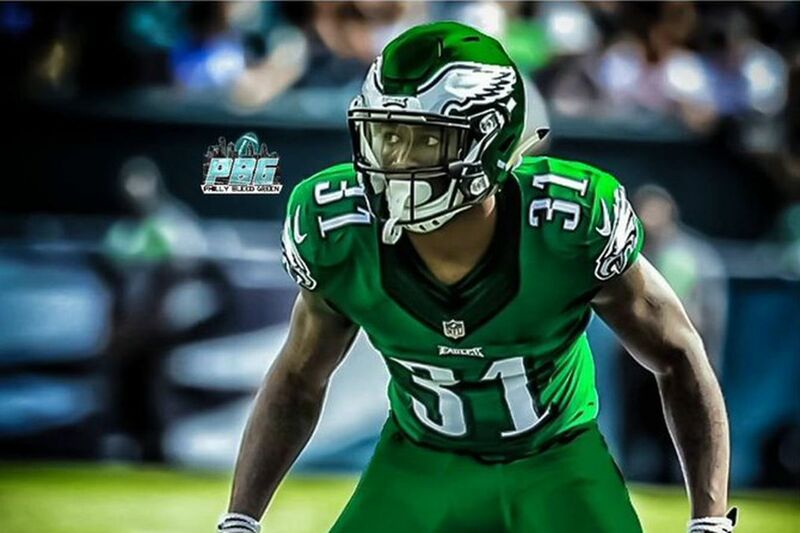 Jalen Mills tweeted out this design, suggesting the Eagles rock an all-green look for the “Color Rush” series last year. Keeping the current design with Kelly green is a cool look. Love the current logo staying on the sleeves. 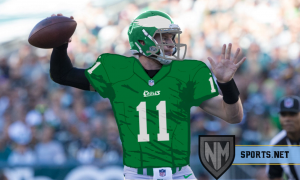 These would most likely be used as a replacement for the midnight green instead of an alternate considering it isn’t a different design then the current jerseys. It does suggest a cool concept of keeping the current logo, and helmet design with Kelly green replacing midnight. So not exactly sure why Tyrod Taylor is the model for this jersey concept but these are straight fire. You don’t see this kind of jersey where one half of the jersey is a color, with the other half consisting of another often in the NFL. This would be a wonderful exception. Getting the old Eagle back on the sleeve, the white helmet with a green wing outline, and a white inside, mimicking these old beauties. Ya, sign me up for one of these. If the NFL wants to go even further and allow two or more helmets per team, this concept is one the Eagles should take a look at. Perhaps a blast back to the Jaws era with this modern version of the 1970’s look. Personally, the stripes on the sleeve aren’t my favorite look, but these are sharp concepts. So many options. This is a great one that has Alshon Jeffery in the Randall Cunningham look of the 90’s. The 90’s jerseys are a little too dark for my taste, perhaps using the 60’s Kelly green with the 90’s jersey design would be a great way of making the perfect alternate. Kelly Green jerseys need to make a comeback in some shape or form within the next few years. 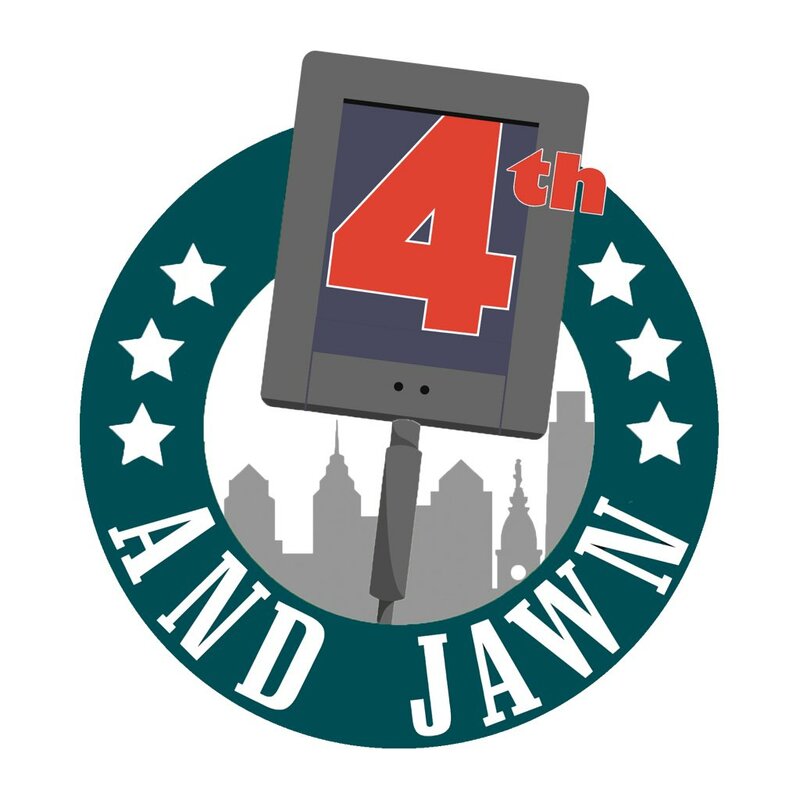 Luckily for Eagles fans, the team wants them back badly. Whether or not they are the primary uniforms is a different story. I grew up loving the Eagles in midnight green. They won their first ever Super Bowl in midnight green. Really, you never fully appreciate something until it is gone and I feel like fans would call for a return to the midnight green after a while if they were removed from the rotation. A perfect strategy for jerseys would be to keep the current jerseys, with the Kelly green as an alternate that is worn three or four times a year. Get a little taste of both. 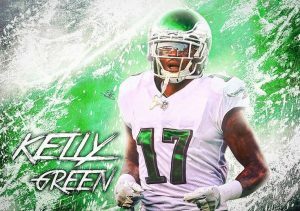 Let us know below what your favorite Kelly green jersey concept is, and if the Eagles should go back to the vintage uniforms full time.